Storm Drain Goalies in action! The chill in the air and the falling leaves are good reminders that some simple fall clean up tips can help improve and protect our environment! 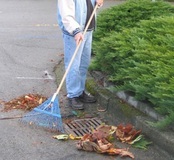 Don’t sweep leaves and grass clippings into the street. When leaves and grass wash into storm drains, they end up in our lakes and streams where they feed algae and consume oxygen as they decay! Grass clippings can also carry pesticides which harm fish and other aquatic life. Turn your leaves into valuable compost – either by bagging them for your waste hauler to take from the curb, composting them in a backyard compost bin, or hauling your leaves, grass, and brush to a drop-off site. Prepare your lawn for next year. While it might seem like your yard goes dormant in the fall, this is actually a great time to prep your lawn for the spring. Aerating will allow oxygen and moisture to reach the roots of plants during winter and will also improve the water retention of your yard, which will reduce the need for irrigation. Get a workout and reduce harmful emissions! Gasoline-powered mowers, leaf blowers, and string trimmers may be faster, but they also use a lot of energy and create hazardous fumes. In fact, a typical riding lawn mower actually produces four times as much pollution per hour as a car! In addition to harmful emissions, the force from gasoline-powered leaf blowers can create clouds of potentially hazardous substances such as mold, pesticides, and allergens. Use a good old fashioned rake and burn calories at the same time! Keep oil, antifreeze, and other automotive chemicals out of the street. Bring them to a Hennepin County drop-off facility for safe disposal. Seven cities, eight agencies and the Elm Creek Watershed Management Commission have collaborated on a six-year project to evaluate conditions in the lakes and streams in the Elm Creek watershed and to plan how best to protect and improve water quality in those waters. The end product, the Elm Creek Watershed Restoration and Protection Strategies (WRAPS) report, provides detailed information about thirteen lakes and four stream systems in this northwestern watershed of 103 square miles. 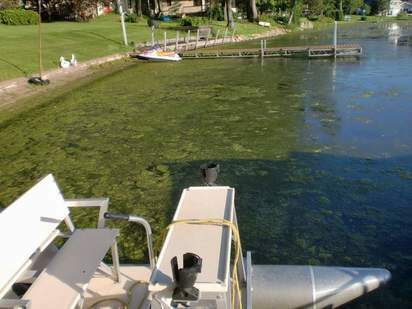 The WRAPS report found that seven of those lakes do not meet state nutrient standards, and the streams contain excessive levels of E. coli bacteria, have low dissolved oxygen, and at least one suffers from excessive chloride concentrations from road salt. Recently revised rules and standards that require new development to provide additional water quality treatment and reduce the volume of runoff from their sites. Closer assessment of land areas found to be contributing excessive sediment and nutrients to the lakes and streams. 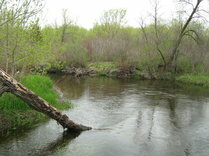 Stabilization of stream banks where erosion is impacting the streams. More targeted efforts to work with and provide incentives to agriculture to make voluntary improvements. Carp in Twin Lake in Crystal, Brooklyn Center and Robbinsdale are about to find out they can run but they can’t hide. The Shingle Creek Watershed Management Commission received a $100,000 grant from the Minnesota Pollution Control Agency’s (MPCA) Section 319 program to help fund an upcoming project to track carp in the four-lake chain of Twin and Ryan Lakes. Carp can degrade a waterbody by stirring up sediment and releasing nutrients into the water, as they’ve done in Upper Twin Lake. The goal of tracking the carp is to find out how they move between the lakes, Ryan Creek, and Shingle Creek so that fish barriers can be installed to limit their movement. The study will also determine where the fish congregate in the winter so they can be removed by commercial fishermen. Following carp removal, the project will install an aeration system in Upper Twin to prevent low oxygen conditions. Raising oxygen levels will improve pan fish populations, which will then keep the carp population in check because the pan fish eat carp eggs. Another important aspect of the project is developing an aquatic vegetation management plan that will be put in place when water clarity improves. The commission received another grant from the MPCA totaling almost $200,000 to study various applications of a new technology that can remove bacteria from stormwater. Urban stormwater can carry high levels of bacteria from excretions from pets, birds, waterfowl, and other wildlife, and bacterial contamination can make lakes and streams unsafe to wade or swim in. Biochar, a charcoal-like product that is relatively inexpensive, has been shown in the lab to remove bacteria and enhance the removal of soluble phosphorus. This grant will test biochar in the real world by studying whether adding it to iron-enhanced sand filters on stormwater ponds or catch basins or directly filtering stream water through biochar are feasible and cost-effective. If proven effective in the field, this will be a valuable new tool in stormwater managers’ toolboxes. The Bassett Creek Watershed Management Commission (BCWMC) is excited to announce the completion of their Watershed Management Plan. What started in 2012 as a simple update progressed into complex, thorough, and productive conversations about how to manage and protect the lakes and streams in the watershed while balancing the interests and needs of multiple entities. The public and local officials weighed in with their concerns and ideas early in the process by responding to a BCWMC survey, attending small-group meetings, and participating in a large “Watershed Summit” in June 2013. Once the issues were framed, the BCWMC Plan Steering Committee met 24 times over two years to develop policies and programs to address the issues. The BCWMC Technical Advisory Committee, consisting of staff from BCWMC communities, state agencies like the Board of Water and Soil Resources and the Minnesota Department of Natural Resources, and partners like the Minneapolis Park and Rec Board and Three Rivers Part District, also provided valuable recommendations, insight, and assistance in developing policies for the plan. In the end, the BCWMC prioritized and classified their lakes and streams, adopted new requirements for development and redevelopment (the Minimal Impact Design Standards), adopted requirements for buffers along some streams and wetlands, and developed a list of large capital projects, like stream restoration projects and stormwater infiltration basins, to implement over the life of the plan. Students at St. Vincent de Paul Catholic School in Brooklyn Park are cleaning the streets! Fourth grade students have participated in the WMWA "What is a Watershed?" lesson for the last 3 years and decided to put the messages into action. The lesson unveils the impacts of leaves, grass clippings and other nutrient-loaded pollution on water quality. Students are encouraged to become Storm Drain Goalies by letting nothing but rain down the drain. For the second year, the St. Vincent de Paul Catholic School's Green Team will venture out to the streets of Osseo to rake, sweep and collect leaves. The City of Osseo staff work in partnership with the school groups to collect the bags of leaves for composting. Students, parents and neighbors enjoy working together and spreading the word. Organizing a street clean-up can be an easy and fun community service project. For tips or assistance in bringing a clean-up or lesson to your school community contact Jen Schaust, jen.schaust@gmail.com. Students involved in Hennepin County’s River Watch program can now compare the data they collect to historical data for their stream and learn about how land cover may impact water quality in the recently launched Hennepin County River Watch interactive map. River Watch is a hands-on environmental education program in which teams of youth assess the health of local streams by identifying and quantifying the stream's biological community. There are currently 18 sites being monitored in the county. For more information, contact Mary Karius at mary.karius@hennepin.us or 612-596-9129. The Master Water Stewards program is a volunteer program for community leaders that identifies, trains, certifies and supports stewards to implement projects on residential and commercial properties that reduce water pollution from urban runoff and educate the community. Hennepin County has supported the development of the Master Water Stewards program through several Green Partners environmental education grants. Information sessions for the 2016 Master Water Steward course will be held October 26 and 27, November 17 and December 8. Learn more. Chloride is increasingly becoming a pollutant of concern in Minnesota’s lakes, streams and rivers. Several watershed organizations are holding upcoming workshops that will address best practices for maintaining safe roads, parking lots and walkways in the winter while reducing salt use. Winter parking lot and sidewalk maintenance workshop for property managers, snowplow drivers, contractors, staff and volunteers. Tuesday, November 17 from 9 a.m. to 2 p.m. at Nine Mile Creek Discovery Point in Eden Prairie. Training is free but registration is required. Register here. Winter road maintenance workshop for city, county and state government winter maintenance professionals. Thursday, October 22 from 9 a.m. to 2 p.m. at the Riley Purgatory Bluff Creek Watershed District in Eden Prairie. Training is free but registration is required. The emerald ash borer is a destructive tree pest that attacks and kills ash trees. Learn more about emerald ash borer at the next Hennepin Natural Resources Partnership meeting on Tuesday, December 1, 2015. The Hennepin Natural Resources Partnership provides a forum for a more holistic and collaborative approach to managing and protecting our land and water. Everyone is welcome to attend, especially those from cities, watersheds, agencies and organizations involved with or interested in natural resources management and protection. RSVP to Stacey Lijewski at stacey.lijewski@hennepin.us or 612-348-9938.